Well built, stylish colour scheme - no frills but perfectly functional. None - for the money it's hard to beat. 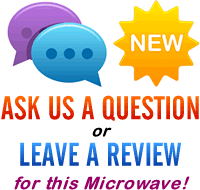 Looking for a small but functional and cheap solo microwave? The blue Akai A24001B could well fit the bill, providing a 20 litre capacity, 6 power levels and a 30 minute manual timing system. 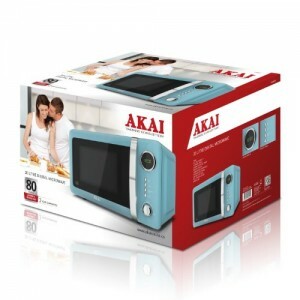 The microwave's finish is a pale blue, which will fit in well with light and pastel shades. That said, it looked good sat in one of our testers kitchen, which was predominantly black. In terms of performance, it cooked well - heating up soup fast and evenly. The jacket potatoes we cooked turned out evenly heated and cooked, with no raw sections. Granted, it doesn't feature a grill or convection oven, but the solo microwave worked without any issues or complaints from our testers. So who is the A24001B aimed at? In terms of size it may be too small for larger households, unless you don't wish to fit any larger dishes inside. For cooking medium sized dishes then it will be fine however. There aren't many blue coloured budget microwaves on the market - and so if that's what you're looking for, then the Akai A24001B will be ideal. The Akai A24001B offers excellent value- currently available for around the £50 mark, it's hard to find any other solo microwaves to rival it. Our testers loved the A24001B - it's simple to operate, cleans easily and cooks well. Recommended.